A luxury address stamp. Adorn each envelope with your address stamp this Christmas and beyond. A very thoughtful wedding or new home gift. This personalised address stamp has a personal handwritten feel. Our address stamp is beautiful to use and beautiful to receive. The address stamp is made to the highest standard with vintage style handles, clear perspex. These are the very best stamps made of the finest materials. They make a luxurious alternative to the wooden block craft style stamps and therefore make a really lovely thoughtful, useful gift. Once made, our address stamp not only sits beautifully on a bureau or desk, it is very handy too. Using the address stamp is much faster when you are short on time and adds an elegant professional touch. Stamp your address on the back of Christmas cards and other day to day correspondence. 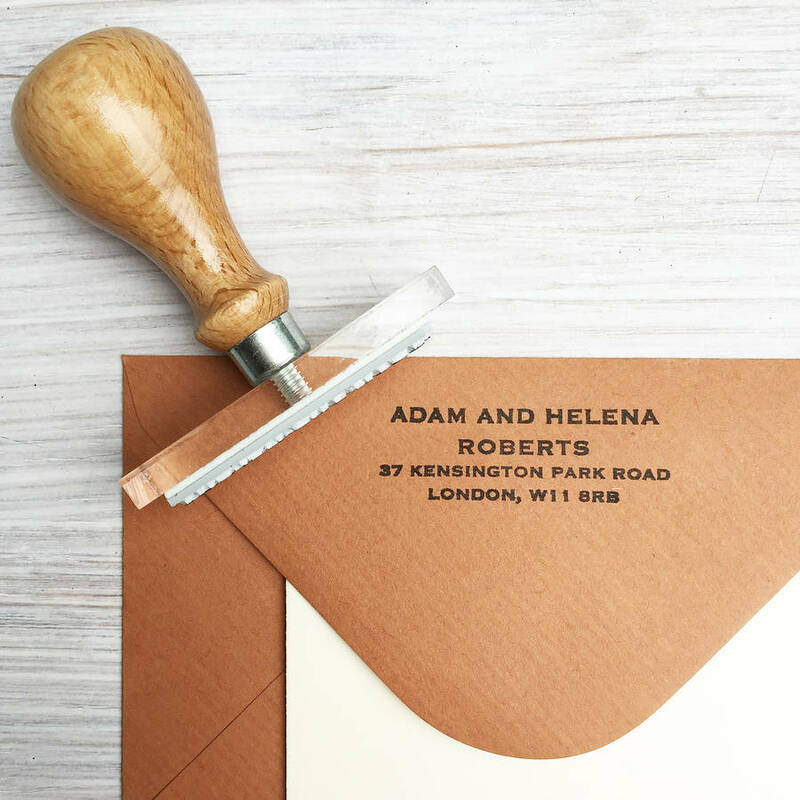 An address stamp makes such a thoughtful and useful new home gift or a wedding gift as newlyweds can use it on thank you cards, celebrating their new married name. Top tip for getting the best results with your address stamp:Invert the address stamp so the rubber is facing the upwards towards the ceiling. Ink the address stamp from above until all of the raised rubber has an even coating of ink and then stamp! If you would like to see your design beforehand please select 'proof required'. We will send you the design of your stamp as per your requirements. You can then make any number of changes you wish and we will redesign and send you to your new requirements. One proof is provided though we can provide additional proofs on request. Please note if you do not respond to approve or provide changes to the proof for more than 48 hours we may send your stamp as ordered so as not to delay your order. If you would like us to wait longer than 48 hours for your approval/changes please simply send us a message. This is a luxury gift quality stamp rather than a wooden block. The rubber on the address stamp is long-lasting (not like flexi polymer) and will continue to print the address even after being used over and over again. The address stamp is hand finished and mounted on solid clear Perspex which enables precise stamping as you can see exactly where you stamp the address. The address stamp is finished with a vintage-inspired wooden handle, making it lovely to have in your home, and a real treat to use. Face the stamp to the ceiling and ink from above for even ink coverage. Size of the impression of the address stamp is approximately 5cm or 7cm in width. Longer names will be smaller to fit. If you have chosen a very long name or Mr & Mrs followed by a surname then you may wish to go for the larger 7cm size address stamp. We have recently extended the number of characters in the address to 90. Please note if you have more than 50 characters or more than 25 characters on any one line, you may need to choose over three lines and/or 7cm size as longer addresses will be made shorter to fit. This product is dispatched to you by Stomp Stamps.